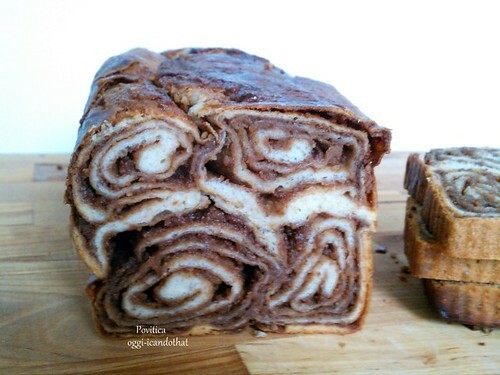 Povitica ~ I Can Do That! 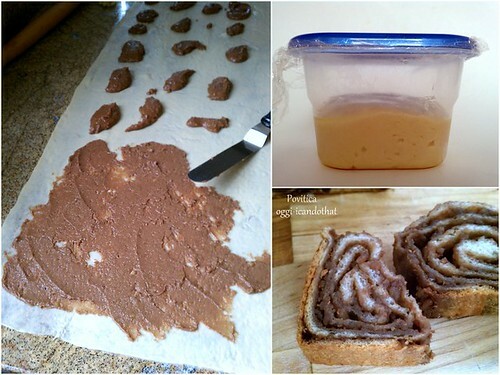 Povitica (pronounced po-va-teet-sa) is traditional Eastern European dessert bread that is traditionally served during the holiday season. It is also known as Nutroll, Potica, Kalachi, Strudia, just to name a few. Family recipes, and the secrets on how to roll the bread so thin, was passed down through generations of families. However, the tradition of baking this type of bread has become somewhat of a dying art form, and I thought it would be a wonderful opportunity for us to learn to make this wonderful sweet bread. 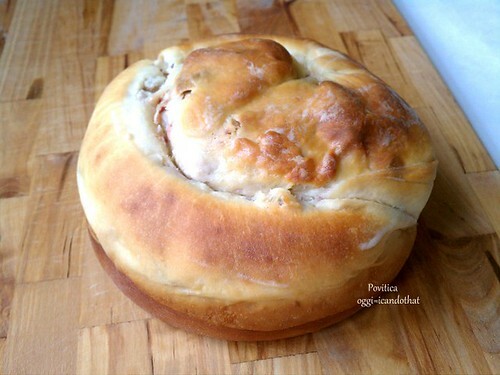 Thank you Jenni for choosing Povitica for this month's Daring Bakers Challenge. It was indeed a wonderful opportunity for us to learn to bake and enjoy this sweet treat. I will surely make them again with a variety of fillings. I baked a quarter batch and followed the recipe except I used dry milk for the dough, adjusting the amount of water, and I ground the walnuts to almost nut butter consistency. This dough doesn't need a machine to put together. It's soft and pliable to knead by hand. Stretching the dough was not too difficult either and I found it really easy if it was made to rest for a few minutes between stretching to relax the dough. Rolling/shaping the dough was a bit tougher because it's thin and I was worried it will tear to expose the filling, fortunately it didn't. Prepare the dough: In a small bowl, stir together first 4 ingredients, cover with plastic wrap, and leave for 5 minutes.In a medium saucepan, heat the milk up to just below boiling, stirring constantly so that a film does not form on the top of the milk. You want it hot enough to scald you, but not boiling. Allow to cool slightly, until it is about 110°F. In a large bowl, mix the scalded milk, 3 tablespoons sugar, and the salt until combined. Add the beaten eggs, yeast mixture, melted butter, and 1 cup of flour. Blend thoroughly and slowly add remaining flour, mixing well until the dough starts to clean the bowl. Turn dough out onto floured surface and knead, gradually adding flour a little at a time, until smooth and does not stick. Place dough in a lightly oiled bowl, cover loosely with plastic wrap and then a kitchen towel and let rise an hour and a half until doubled in size. Prepare the filling: In a large bowl mix together the ground walnuts, sugar, cinnamon and cocoa. Heat the milk and butter to boiling. Pour the liquid over the nut/sugar mixture. Add the eggs and vanilla and mix thoroughly. Allow to stand at room temperature until ready to be spread on the dough. If the mixture thickens, add a small amount of warm milk. Roll and assemble the dough: Spread a clean sheet or cloth over your entire table so that it is covered. Sprinkle with a couple of tablespoons to a handful of flour. Place the dough on the sheet and roll the dough out with a rolling pin, starting in the middle and working your way out, until it measures roughly 10 -12 inches in diameter. Using the tops of your hands, stretch dough out from the center until the dough is thin and uniformly opaque. You can also use your rolling pin, if you prefer. As you work, continually pick up the dough from the table, not only to help in stretching it out, but also to make sure that it is not sticking. The dough should be so thin that you can see the color and perhaps the pattern of the sheet underneath. Spoon filling evenly over dough until covered. Lift the edge of the cloth and gently roll the dough like a jelly roll. Once the dough is rolled up into a rope, gently lift it up and place it into a greased loaf pan in the shape of a “U”, with the ends meeting in the middle. You want to coil the dough around itself, as this will give the dough its characteristic look when sliced. Cover pans lightly will plastic wrap and allow to rest for approximately 15 minutes. Bake the loaf: Preheat oven to moderate 350°F. Remove plastic wrap from dough, brush with coffee mixture or egg wash and bake for approximately 15 minutes. Remove bread from oven and brush with melted butter. Turn down the oven temperature to 300°F and bake for an additional 45 minutes, or until done. Check the bread after 30 minutes to ensure that it is not getting too brown. You may cover the loaves with a sheet of aluminum foil if needed. Remove from the oven and allow to cool in the pan on a wire rack for 40 minutes. This one is filled with cream cheese, yogurt, and crumbled freeze-dried strawberries and baked in a 7-inch round pan. I like that it is sweet and tart from the yogurt and dried strawberries. The Daring Bakers' [Jenni's] recipe and step-by-step photos are here. Fantastic job! Your poviticas turned out beautifully, and I am so glad you found the recipe easy to work with! I love the strawberry one, delicious! 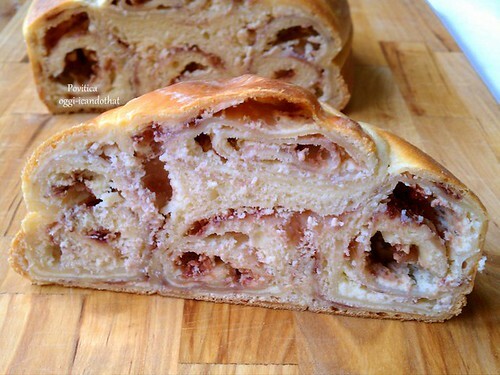 Oh my gosh, that cream cheese, yogurt and strawberry povitica is calling my name. They both look outstanding, though - really amazing job!! Oggi, I love the outside look of the cream cheese one as well. I wanted to try a different shape but did not get to it. Anyway hey both look splendid and soooo yummy! Great job! Great job! I totally forgot about the challenge. Mmm, that strawberry filling sounds so good! Great job! Mm, I love the sound of the cream cheese, yoghurt and strawberry. A little taste of summer gone by. It is a very impressive looking loaf! They're both beautiful. Great job! Hi, i tried this recipe. ingredients are quite expensive, particularly the walnuts, but it was GREAT!!! !